Coursera, an online learning platform, is designed to help users learn new skills and open their minds to new ideas—but their discovery mechanisms were holding them back. In this case study, uncover how Coursera elevated their search UX to meet the standards set by leading search players, and achieve the flexibility needed to customize their search process for their customers. 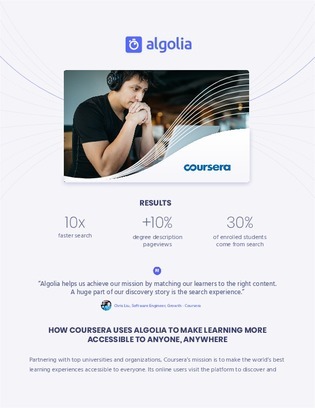 To learn how Algolia helped Coursera liberate itself from its previous search restraints, download this case study, and find out how Coursera made learning more accessible to anyone, anywhere.